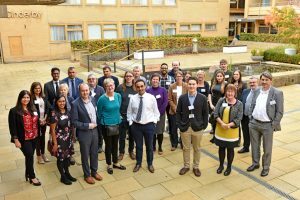 The first forum for academics, industry leaders, charities and doctors to explore a potentially revolutionary method of diagnosing heart and lung disease from a patient’s breath sample was held in Leicester last week (1st November). The EMBER (East Midlands Breathomics Pathology Node) Industry Symposium gathered to understand how their combined efforts could use the latest technologies to take us a step closer to accurately diagnosing conditions such as asthma, pneumonia, heart failure and chronic obstructive pulmonary disease (COPD), without the need for invasive procedures. Currently a team of clinicians and research staff from Leicester’s Hospitals are collecting breath samples from patients’ that are admitted to hospital with acute shortness of breath. These breath samples are being chemically analysed by scientists in the laboratories at the University of Leicester and Loughborough University to understand what is in the breath sample. The air we breathe out contains a mixture of different chemicals that can tell us about what is taking place in the lungs and the blood. The breath sample is run through a machine to produce a ‘map’ of chemicals in the breath. This map can be used to spot markers that may tell us about the health of the patient, which could help doctors select the best course of treatment. Speaking at the symposium, Professor Salman Siddiqui, Professor of Airway Disease and Respiratory Medicine at the NIHR Leicester Biomedical Research Centre, said: “When a patient comes into hospital they don’t say ‘I have heart failure’, they describe their symptoms and clinicians try to find the cause of those symptoms to make a diagnosis. However, our current diagnostic tools are not always sensitive and specific enough to pick up certain conditions in their early stages, such as diseases deep in the lungs. The study has been funded by the Medical Research Council (MRC) and Engineering and Physical Sciences Research Council (EPSRC) to help develop non-invasive tests for diagnosing disease in breathless patients.